The first settlers of Lambousa came from Greece in the 13th century B.C. ; the region came under Phoenician control in the 8th century B.C..During the Roman and the Byzantine periods the region enjoyed prosperity. Civilian architectural buildings like a theatre and a gymnasium were also constructed. This period of prosperity ended with the Arab raids in the 7th century. 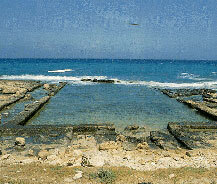 Among the noteworthy remains are the walls, the rock tombs and the fish pools. The fish pools were carved in the Roman period; they contain canals for the clean water to flow in and for the dirty and warm water to flow out. Most of the findings belonging to Lambousa which contain a lot of valuable items like plates and spoons were brought to daylight during a two-stage excavation activity in the 19 hundreds. Unfortunately, most of these are being exhibited in the museums of foreign cities like London and New York. These treasures are thought to have been buried underground during the raids of the Arab pirates. As most items bear the Empire seal, they are understood to have been made between 627-630.